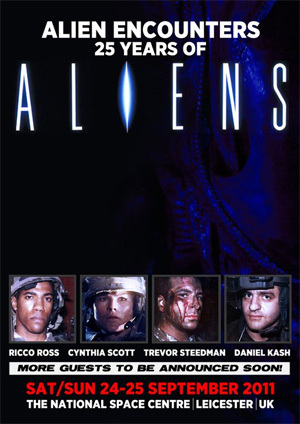 The convention will also feature the Alien Encounters event (different from the documentary), an Alien Wars style attraction, shooting ranges with Airsoft Pulse Rifles & Nerfguns, prop displays, Q&As with the actors, autographs, photo shoots, the Harry Harris Aliens Collection & Archive, a premiere screening of Aliens Epilogue and potentially the Alien Encounters documentary. More guests and attractions to be announced once the ink is dry. Be sure to “Like” and follow the Alien Encounters & Aliens Epilogue Facebook pages for information. Dam I need a vacation to britian ! Rick Ross is going to be there? There is going to be some good music then. Vulhala and I are gonna be there. Gotta get the AvPGalaxy representation in. Just come to the UK for a bit. It is, if you care! I wonder how much tickets'll cost. That trip would probably use up most, if not all, of my life savings. I wonder what the age restrictions are? If you came, not only would I stay the full weekend, but I guarantee by the end you would renounce your colonialist passport, and return to the motherland for life. Mostly by way of strip clubs, dodgy kebabs, and a whole f**k-ton of Ale.